German/British prehistorian. Born, Berlin 1892. Died, Oxford 1975. Studied medicine and Egyptology at the University of Berlin. Excavated at Hermopolis. Assistant Keeper of Egyptology, Manchester Museum. 1) Material relating to proposed third edition of 'Egypt's Beginnings' submitted to the Griffith Institute by E. Baumgartel for publication in 1974. 2) Material related to Predynastic objects in Brooklyn Museum, via the Department of Antiquities, Ashmolean Museum, Oxford, in February 2002. 3) Seven card index boxes, via the Department of Antiquities, Ashmolean Museum, Oxford, in July 2004. 1) Two typescripts with pages from the published edition, and handwritten notes and editing marks, together with a small box of glass negatives of plates marked 'Plates for Part 2'. Both entitled ''Egypt's Beginnings', being the third edition of <i>The Cultures of Prehistoric Egypt</i> by Elise J. Baumgartel.' Also notes on the manuscript by Barry Kemp, dated 1975. 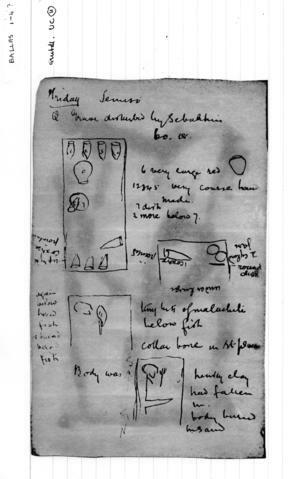 2) Collected notes and photographs relating to Predynastic material in The Brooklyn Museum. Two reports: one a copy of 'Report of Henry de Morgan on his researches in the Nile Valley between Esneh and Gebel-Silsilèh, during the winter of 1907-1908'; the other, no title or date, addressed 'To A. Augustus Healy, Esq., President of the Brooklyn of Arts & Sciences' [sic]. a) Naqada and Ballas Site Index [4 boxes]: Identified contents of grave groups from numbered tombs in Predynastic cemetery at Naqada, also Naqada town site, and Ballas (excav. Petrie, 1895), with current museum location; arranged by tomb number and cross referenced to <i>Naqada and Ballas</i> (London, 1896). The card index was created by Elise J. Baumgartel as the basis for her <i>Petrie’s Naqada Excavation. A Supplement</i> (London, 1970); subsequently maintained and updated by Joan Crowfoot Payne, ‘Appendix to Naqada Excavations Supplement’, <i>JEA</i> 73 (1987), 181-9.
b) Petrie’s Naqada Site Records [2 boxes] (sketches of numbered graves showing disposition of bodies and grave goods): photocopies of the entries in site notebooks, filed by tomb number. c) Petrie’s Ballas Site Records [1 box] (sketches of numbered graves showing disposition of bodies and grave goods): photocopies of the entries in site notebooks, filed by tomb number. Copyright Griffith Institute, Oxford, except for photographs and xeroxes of reports belonging to The Brooklyn Museum. These are originals. The Brooklyn Museum owns the original copies of excavation reports copied for Baumgartel. 1) Earlier editions of Elise J. Baumgartel, <i>The Cultures of Prehistoric Egypt</i>, vol. i (1947; revised ed. 1955); vol. ii (1960). 3) Elise J. Baumgartel, <i>Petrie’s Naqada Excavation. A Supplement</i> (London, 1970); Joan Crowfoot Payne, ‘Appendix to Naqada Excavations Supplement’, <i>JEA</i> 73 (1987), 181-9.